Nine people suspected of belonging to Sinai terrorist cell killed in police raid in northeastern Egypt. Nine people suspected of belonging to a cell behind terrorist attacks in the Sinai Peninsula were killed during a police raid in northeastern Egypt, the interior ministry said Sunday, according to AFP. 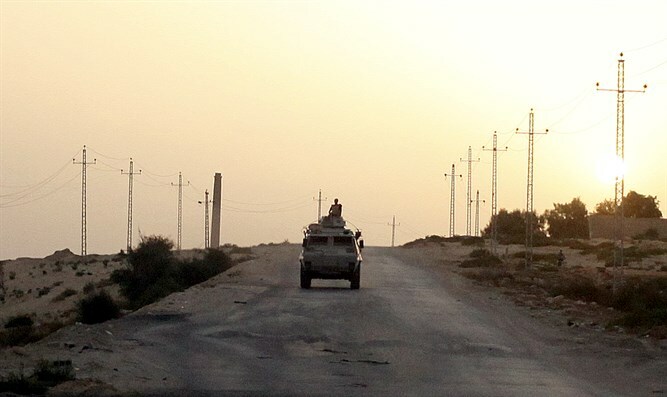 The cell based in Sharqiya province was implicated in attacks on "security posts and military apparatus in North Sinai, which killed many members of the armed forces and police force," the ministry said in a statement quoted by the news agency. Members were also accused of plotting other attacks on vital infrastructure in the region, it added. Police found automatic rifles and ammunition during the raid on a site that had been used as a weapons and explosives training center. Security forces in Cairo also detained nine people and seized weapons and explosive devices, the ministry said. Egypt's military and security forces have been waging a tough and costly campaign against jihadists in the towns, villages and desert mountains of northern Sinai. Most of the attacks in the Sinai Peninsula in recent years have been claimed by the Sinai Province, the Egyptian affiliate of the Islamic State (ISIS) which pledged allegiance to the jihadists in 2014. An attack on a Sufi mosque in the region last month claimed the lives of 305 people.